Its fairtrade fortnight and the Fairtrade Foundation have lots of cool fairtrade competitions on their facebook page. I decided to enter the baking competition, so for your delight I present the fairtrade curly windmill cake! Normally for Sunday Scribblings i would write a poem, but as the theme is food, I would like to take the opportunity to tell you about the Foodie Cool Board. 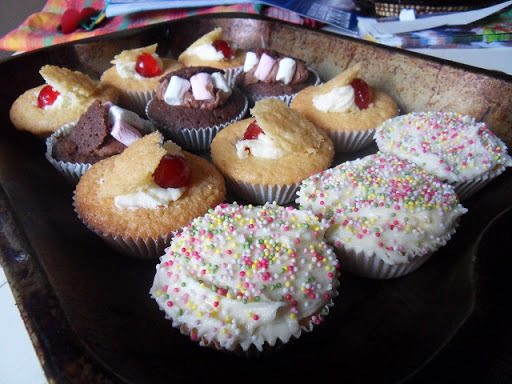 for about as long as I have been blogging, I have been cooking, R and I have eaten it and then I have blogged including a score, from the awesome subzero, through cool, ok and down to uncool. It has included all sorts of yummy things, quite a lot from Jamie Oliver’s magazine, along with some recipes I learnt from my mother – I would love it if you took a little journey with R and I enjoying food and the Foodie Cool Board as much as we have! I have slipped a bit over the last month and have been resorting to pizza and the like a bit too much – bought pizza at that (eek). But its back to form now and something from the latest Jamie Oliver magazine – a beef curry which was about as quick to make as the bought pizza – but much yummier. 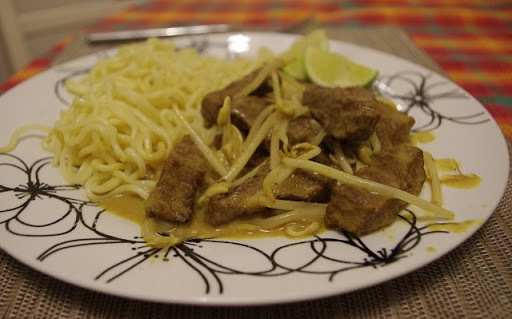 Fried beef, a few spices, some ginger and garlic, coconut milk, (didnt have any of the curry leaves he suggested)and at the end bean sprouts, served with noodles. 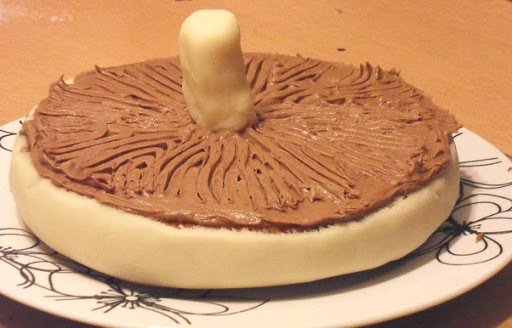 I have to say, when I saw the kind of food in Jamie Oliver’s 30 minute meals, I thought, 30 minutes… yeah right. But you know, he isn’t joking. 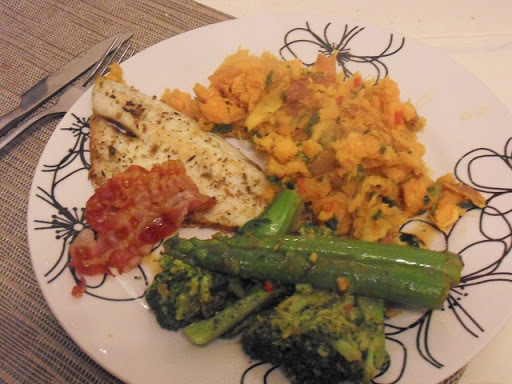 I have tried the sea bass with spicy sweet potato and greens – it was one of the nicest meals R and i have had in ages and it gets a resounding subzero from us. 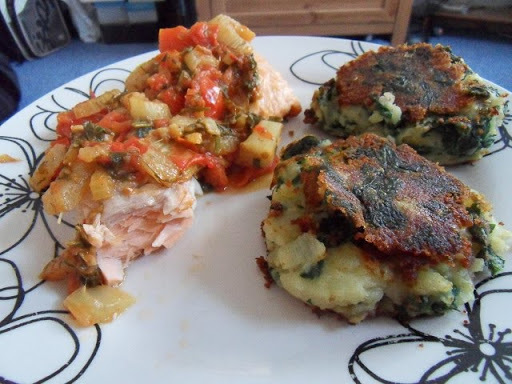 As the latest Jamie Oliver magazine is out, it was time to try a new recipe, this time salmon with a very yummy sauce. This had garlic, fennel, tomatoes, dill and mint in it. I run a cooking club on a Wednesday evening. This week there were less young people than I exprected so I had some turkey mince spare. 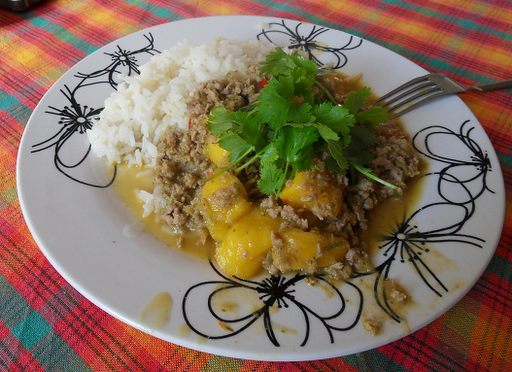 Googled turkey mince and found this recipie for turkey and mango curry on the beeb. As the recipie has no milk in it I didnt have to adjust it at all – we loved it and gave it a rating of subzero – I recomend it!